There are two major trends in healthcare today that put extreme pressure on the operations of not-for-profit healthcare districts. The expense of staying current with advances in technology keeps skyrocketing, just as payments received for the care we deliver keeps plummeting. So when a need arises that cannot be met by the District’s budget alone, the Foundation reaches out—on behalf of the community—to secure donations that will allow us to purchase the critical equipment and establish the vital patient programs that support everyone’s well-being. Throughout each year, the Foundation receives funds from the generosity of grateful patients, targeted outreach campaigns, local donors, and engaging fundraising events in the community. Giving is a powerful act that enriches the lives of those who give and those who receive. And giving to the Northern Inyo Hospital Foundation can make a profound impact by helping to enhance lives. Whether you support us with a charitable gift or participate in one of our events, your generosity makes a difference in the health, well-being, and vitality of so many in our community. We welcome your input or questions. Please feel free to give us a call or send us an email. We will get back to you as soon as possible. Ken Partridge was born and raised to a ranching family here in Bishop. He graduated Bishop High in 1961, then attended La Sierra University, later receiving a degree in Mortuary Science from the California College of Mortuary Science in 1964. Ken served in the U.S. Army and was stationed in Korea as a combat medic from 1966-1968. Upon returning from Korea he attended the University of Nevada, Reno where he received his Bachelor's Degree in Accounting. His professional career began as the Controller for Reno Disposal. Ken then went to work for the Nevada System of Higher Education where he became the Vice Chancellor of Finance. Ken returned to Bishop in 1992 semi-retired where he runs a ranch, a horse therapy program, and creates custom leather work. Outside of Ken’s service to the Northern Inyo Hospital Foundation, he has also served as President for the Bishop Community Concert Association. Carole Wade was raised in Chicago, Illinois and moved out West to Ventura, California when she was 15. After high school, Carole worked in restaurant and banquet management before obtaining her license to sell real estate. Carole has been living and working in real estate in the Eastern Sierra for the past 20 years. She enjoys all that the area has to offer and likes to take hikes and ride her bike in this beautiful landscape. 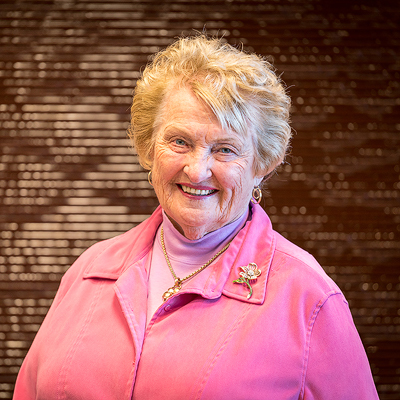 Along with her service on the Northern Inyo Hospital Foundation Board, Carole is active in the Lions Club where she has served in a number of roles, including President. Mary Mae Kilpatrick is a retired educator. She began her career in education as an elementary school teacher. She retired as Superintendent/Principal of Round Valley Elementary School District. Among the accolades she earned as an educator, Mary Mae was named Outstanding Elementary Teacher of America and was the first mentor teacher approved by the State of California. Many local organizations have benefitted from Mrs. Kilpatrick’s volunteer leadership, including Playhouse 395, the High Sierra Chapter of Sweet Adelines, the Bishop Community Concert Association, the Bishop Friendship Center and the American Legion Auxiliary, Unit 118. Mary Mae is currently the treasurer for the Northern Inyo Healthcare District Board of Directors, representing Zone IV, and she serves as the secretary for the Northern Inyo Hospital Foundation Board of Directors. She and her husband, Chuck, live in Bishop. They have one daughter, three grandchildren and three great-grandchildren, with a third on the way. Heidi Dougherty was born in Los Angeles and raised by parents who valued community service. It was the inspiration for her life. Heidi graduated from Queen of Angels School of Nursing and worked as an RN for 40 years. She raised her family of four children with her husband of 42 years and has 7 grand children. After working in orthopedics, intensive care, and psychiatric services, Heidi became the Medical-Surgical Floor director. After retiring in 2005, Heidi and her husband moved to Bishop. She has a strong interest in serving the community and volunteered through the Ombudsman office to assist the elderly. She is active with the Catholic Church as a lector and serves on the Saint Vincent de Paul society. As an art docent for the Elm Street third grade, Heidi presents famous art works to expand third graders horizons and stimulate interest in art. A member of Athena, Heidi has benefited by learning from other members and sharing in presentations about healthcare and the history of the Owens Valley. In 2014, Dr. Meredick moved to Bishop and began practicing at Northern Inyo Healthcare District’s Orthopedic Clinic. He has been serving on the Northern Inyo Hospital Foundation’s Board of Directors since 2015. Jane Thompson recently moved to Bishop after retiring from 31 years of service at the University of California Irvine Medical Center in Orange, California. There she served as the Admissions Manager and the Financial Manager for the Transplant Unit. During her tenure there she was very involved in patient, physician, and staff interaction and communication. Jane served as a member of the National Transplant Financial Managers Association and the Managers Forum. She also served on numerous quality improvement committees and forums for UC Irvine Medical Center. Jane has been married to her husband, Chuck, for 51 years and their children and grandchildren live in Southern California where they visit often. Jane and Chuck enjoy traveling in their RV, fishing, and just enjoying the beauty of the Eastern Sierra. Since moving to Bishop, they both have joined other local organizations including the VFW Post 8988 and the Northern Inyo Hospital Auxiliary. Jane is excited to join the board of the Foundation and is looking forward to serving the community by improving the programs and services offered by the Northern Inyo Healthcare District. Sharon Moore was born in Windsor, Ontario Canada, moving to California when she was just 12. She has been married for 54 years to her husband, Jim. They spent their first 34 years together in a home in Whittier, CA where they raised two children: a daughter, Carrie, and a son, Jim. While in Whittier, Sharon worked 24 of those years at one dental office. She started her career there as a dental assistant, later moving up to take over the front desk coverage, as well as training new staff in the front desk duties. Sharon and Jim moved to Bishop 19 years ago, and Sharon joined the Auxiliary shortly after. She has held a number of roles within the Auxiliary, namely President, Newsletter Chair, Workshop Chair, Boutique Chair, and overseeing the Hospital Library. She currently serves as Treasurer. Sharon is always working hard to help the Auxiliary raise money to purchase life saving equipment for the Northern Inyo Healthcare District. Pete Watercott, who hails from St. Cloud, Minnesota, has been a resident of Bishop and the Eastern Sierra since 1972. Known throughout the Eastern Sierra and beyond as “Fiddlin’ Pete”, he retired in 2008 after 20 years of dedication as the Foodservice Supervisor for the Inyo Mono Area Agency on Aging. Pete has served on both the Foundation Board and the Northern Inyo Healthcare District Board since 1998, and is currently in his fifth term with the District. While on the District Board he played a role in the establishment of the Rural Health Clinic, and was involved in the successful planning and building of the new Northern Inyo Hospital. During his tenure on the Foundation Board he has helped raise funds for the District through the very successful Bishop High Sierra Ultra Marathons.In addition to his work with the Foundation, Pete also serves on the Boards of Directors of The Inyo Council for the Arts and the Laws Railroad Museum. He was honored as The Inyo Register newspaper’s Citizen of the Year in 1994 and the Best Friend of the Packer by the Bishop Mule Days Celebration in 2014. He and his wife, Kathryn Erickson, make their home in Bishop with their two dogs, two cats, and six chickens. Greg Bissonette has been living and playing in the Eastern Sierra since 1992. He first started out as an elementary school teacher working for the Mammoth Unified School District. In 2003, Greg took a job at Southern Mono Healthcare District’s Mammoth Hospital as their Grant Writer and Fund Development Coordinator. During his tenure there he helped fund initiatives such as bringing on digital mammography, providing access to low-income residents for pediatric dentistry, and raising funds for the Cancer Outreach program. The major events he was responsible for were the Annual Brian Venneman Memorial Cancer Outreach Golf Tournament and the Festival of Trees gala dinner and auction. In 2014 Greg saw the opportunity to take the next step in his career and accepted the position of Executive Director for Northern Inyo Healthcare District’s foundation. Greg oversees the community driven foundation board, manages all fundraising for the District, and administers all grant activities.